Riitta Päiväläinen (Maaninka, Finland, 1969) graduated from The Helsinki School in 2002. She started working on the Vestige thematic in 1996 by developing different series such as the ones we exhibit today: “Structura”, “Wind” and “Aomori Blue Forest”. 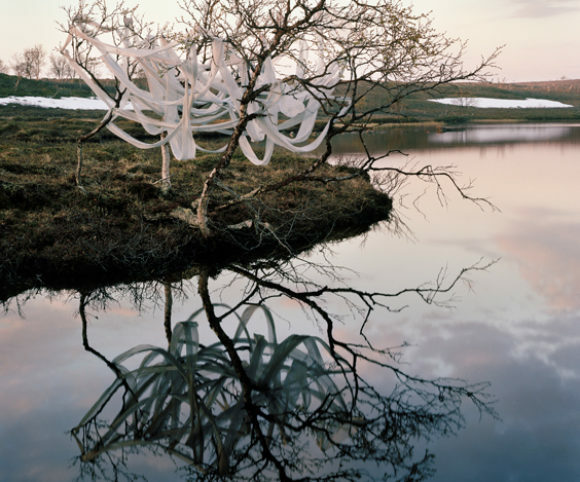 Following a sort of child’s game, Riitta builds up installations made of old clothing from flea markets and second-hand shops and that later she photographs in astonishing landscapes. Bringing these two elements together she creates an unusual dialogue. The garments become frozen sculptures that symbolically recreate the aura of their former owners, a call to memory and to lost identity, according to Riitta, “an imaginary meeting”.